"Jesus Christ, Ordway Performers Have the Voices of Angels!" "I believe in the restorative power of theater. 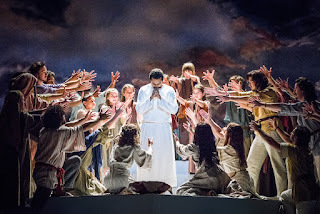 If you need your spirit restored, I highly recommend seeing the Ordway's new production of Jesus Christ Superstar." "The number one reason to see the show at the Ordway is this mostly local cast that is absolutely spectacular." "This entire production is stunning from the set, that fits together like puzzle pieces, to the costumes, lighting, and fantastic pit orchestra, conducted by Andrew Bourgoin."